After sending in his reply Mr. Ilangamuwa contacted Mr. Lal Wickrematunge , the chairperson of the Leader publication (Pvt.) Ltd., and informed him about this article. Mr. Wickrematunge stated that he was unaware of this publication as he had not read the paper as yet. The chairperson promised to take up the matter and to publish the reply of Mr. Ilangamuwa. (April 05, Colombo, Sri Lanka Guardian) Irurasa, a sister publication of the Sunday Leader failed to publish a reply sent by the editor of the Sri Lanka Guardian, Nilantha Ilangamuwa. Irurasa published on the March 27, 2011 an article under entitled 'Editor of Lanka Guardian is a liar that makes up lies'. Mr. Ilangamuwa sent in a detailed reply to each of the allegations made against him stating that the entire article filed by someone using the pen name, Atharaa was fabricated and had no basis in fact. Mr. Ilangamuwa stated that the writing of such fabricated stories which are slanderous amounts to a malicious publication of defamatory nature and therefore he would instruct a lawyer to take appropriate action to claim damages for this publication. He demanded an immediate apology to be published together with a draft reply which he communicated to the chairperson of the Leader Publications (Pvt) Ltd., Mr. Lal Wickrematunge. After sending in his reply Mr. Ilangamuwa contacted Mr. Lal Wickrematunge , the chairperson of the Leader publication (Pvt.) Ltd., and informed him about this article. Mr. Wickrematunge stated that he was unaware of this publication as he had not read the paper as yet. The chairperson promised to take up the matter and to publish the reply of Mr. Ilangamuwa. The next day again Mr. Ilangamuwa contacted the chairperson who confirmed the receipt of his reply and also, by then, he was more aware of the defamatory article which was published in the Irurasa. The author of the aforementioned article was Mr. Mohan Lal Piyadasa, who is the Chief Editor of the newspaper. Mr. Ilangamuwa in his reply has taken up defamatory references made to his past career in the Upali Newspapers. He stated that the author of the defamatory article without any reference to any source on which he based his allegations has cooked up completely false stories with the deliberate intent to create an adverse inference against Mr. Ilangamuwa as a journalist. The defamatory article also refers to Mr. Ilangamuwa as having worked for The Nation and Rivira newspapers and as having been involved with misconduct. In fact, Mr. Ilangamuwa has never worked at these newspapers at any time. On March 12 a person writing under the pen name 'Firing Line' made some defamatory statements against Mr. Ilangamuwa and when he reputed these allegations the Nation published the letter sent by Mr. Ilangamuwa. 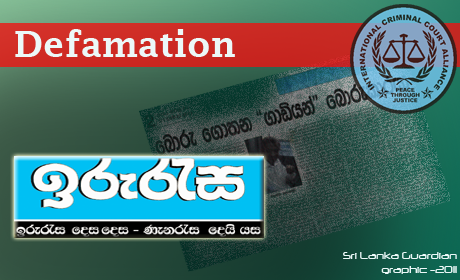 During the same weekend that Irurasa published this defamatory article another web-based newspaper, Lanka-C-News also published a similar baseless article and when Mr. Ilangamuwa sent his reply C-News published the full reply together with an apology for the previous publication stating that it expressed its apology for any mental anguish caused by its previous publication. The Sri Lanka Guardian understands that the article in Irurasa was written at the instigation of another journalist working in another newspaper. The publication of these attacks at the same time without revealing any sources and without being based on any facts is part of a bitter campaign carried out against the web publications. It is no accident that Mr. Bennett Rupasinghe, the editor of Lanka-E-News was arrested under fabricated charges more or less within the same time frame. The Sri Lanka Guardian regrets that Irurasa, which is a sister paper of the Sunday Leader has stooped to this kind of scurrilous and defamatory publications and engaged in the attempt to suppress the freedom of the media. The Sunday Leader's founding editor Lasantha Wickrematunge was assassinated due to his fearless defence of the freedom of speech and the freedom of the media. The Sri Lanka Guardian also regrets that the reply sent by Mr. Ilangamuwa which has been received by the chairperson of the Leader publication (Pvt.) Ltd. was not published. This is against all the basic ethics relating to the right of reply. The Sri Lanka Guardian will pursue this matter through its lawyers by taking appropriate action against this defamatory publication.